Remember the Zupers Kickstarter campaign goes all of this month!!!! We love Zupers at MamaBreak and know you do too! We love this giveaway because it includes 4 pair PLUS $50 Amazon Gift Card!!!! CHRISTMAS SHOPPING!!!!! Wahoo!!!!! For those who have heard of Züpers, they are innovative, adorable leggings that are designed for little girls who are constantly on the go. Each pair of Züpers leggings are made using comfy, rip resistant yoga fabric with retro-inspired print and UVB protection. The real innovative part to these leggings, however, are the removable kneepads that protect little legs, allowing parents to relax as girls play sports or explore outdoors. Knowing that little girls want to show off their personal style, Züpers is working to add 12 new styles to their collection (9 prints & 3 solids). To do this, they need your help! They are working hard on Kickstarter to raise the funds to make these new leggings, and in fact they have already raised over $3,000 of their $5,000 goal, making it very likely these pants will be made. 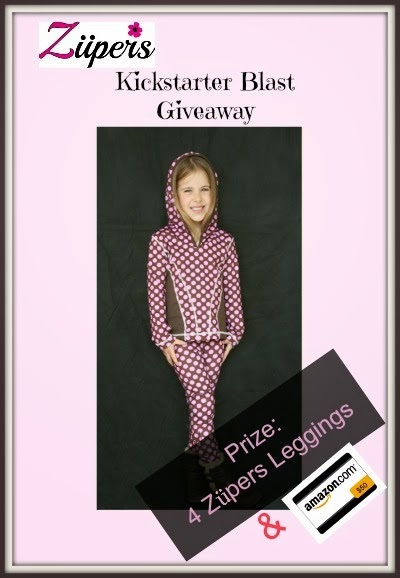 To help them raise their goal, they are offering amazing deals on anyone who wants to purchase these leggings, as well as adorable ZüpersGirls earrings. To learn more about these leggings and why little girls in your family NEED them, make sure to check out the Züpers Kickstarter page! To help celebrate the start of their Kickstarter project, Züpers is giving away 4 leggings from their current collection. 4 of our lucky readers will get one of these sets of leggings, allowing their children to look even more stylish as they go safer into the holiday season. To make this even sweeter, Budget Earth is adding an extra $50 Amazon Gift Card to one lucky grand prize winner. To learn more, make sure to read the rules below and then enter through the Rafflecopter! 3 winners will receive a pair of Züpers Leggings from their current collection (not Kickstarter). 1 Grand Prize winner will receive a $50 Amazon Gift Card in addition to a pair of Züpers Leggings from their current collection. Giveaway ends November 20th at 11:59pm. Budget Earth & other blogs are not responsible for Züpers Prize Fulfillment. Budget Earth IS responsible for $50 Amazon Gift Code. Disclosure: MamaBreak did not receive compensation for this giveaway. Facebook, Twitter, & Pinterest are in no way associated with this giveaway. Prize fulfillment and shipping will be handle by Züpers & Budget Earth. Would you like to have your products featured in a similar giveaway event? Want to increase your social media exposure before the holiday season? See how Mom Powered Media can help! Contact susan.l.bewley@gmail.com to see what we can do for your company!